The concepts of Machine Learning and Artificial Intelligence have been around for a long time – it is until recently that the programming tools and computer hardware have evolved to make it available to the rest of us outside academia. Do you use Snapchat (or Instagram/Facebook stories)? You certainly enjoy using the puppy dog or luscious cat filters … How the apps find your face and determine where your eyes, nose and mouth are (and where to position the filter) are all the result of Machine Learning inside your phone. When you speak to Siri (Echo, Cortana or Alexa) … you are also invoking some complex applications that make sure your voice, sentence and meanings are converted into “something” the machine can understand. How to explain it to the rest of us? At the simplest level, you can think of Machine Learning as a trial-and-error application that, as more trials happen, the fewer errors appear as a result. 1 = you bid too little. This approach is for illustration purposes, there are plenty of other ways of finding the value that could be optimal. The above is a simple process anyone would follow to crack the challenge, and although super simple and fixed, we can say that every day you are close to “learning” what is the cost of the ice cream that you so badly want. I get it … so? Now imagine there are different (many!) types of ice cream sold by different vans, and you are “Ice cream Oracle of Taste” (or IoT for short!) – as a consultant, people will come to you and ask for your help finding the cost of the ice cream as fast as possible. From your experience (Fig. 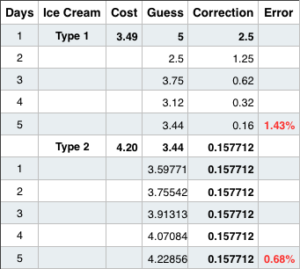 1), you can now start approaching the right ice cream values with an initial bid (and an increment value) that are closer to what is expected for ice cream. By just a simple variation, the error reduced from 0.95 % to 0.68 %! This illustration is very (VERY!!) 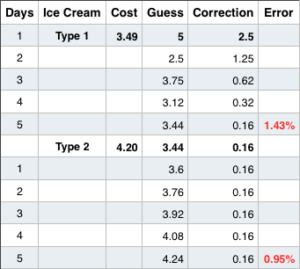 simple, but if you imagine that you start with not 1, but 100K types of ice cream as your initial data, you will have a formula (and Guess & Correction values) that will approximate your solution faster. … and that is Machine Learning for the rest of us!